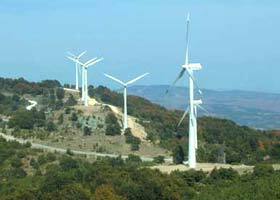 The wind park Aspri Petra is situated in the region of Rodopi, Kexros area, numbering 22 wind turbines generating 19,5 MW. The wind park Geraki is situated in the region of Rodopi, Kexros area, numbering 16 wind turbines generating 14,25 MW. 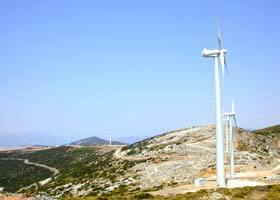 International Wind Power S.A., has, since October 2001, put into operation a 7.40 MW Wind Park, which consists of 10 wind turbines, at Iliolousti, 20 km North- North East of Marmari in Evia. Presently, summer 2006, another 10 wind turbines rated at 9.0 MW are being erected at the site. 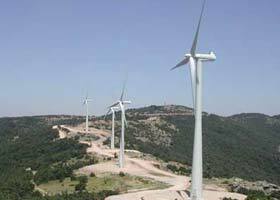 The wind park Monastiri is situated in the region of Rodopi, Kexros area, numbering 8 wind turbines generating 6,75 MW. 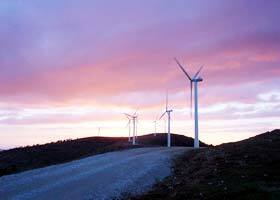 Another Wind Park in Thrace, capable of generating 10,8 MW, is in operation since October 2004, named Monastiri ΙΙ. The wind park Soros, situated in the area of Evros, near Alexandroupolis, consists of 13 wind turbines generating 19,5 MW.